As I was perusing the SB-Projects site on the different IR protocol formats, I decided to make a summary but later found out that it was a pretty standard thing, as documented by a Vishay document “Data Formats for IR Remote Control” (pdf). The infrared remote control signals are layered on top of a carrier signal of 36 or 38kHz, therefore the signal can only be “on” or “off”. A transmission typically starts with an a burst (“on” state) that is used for the Automatic Gain Control (AGC) circuitry in the receiver, followed by the “off” state and the actual data transmission. There are 3 basic types of data transmission formats, which are illustrated in the following diagram. 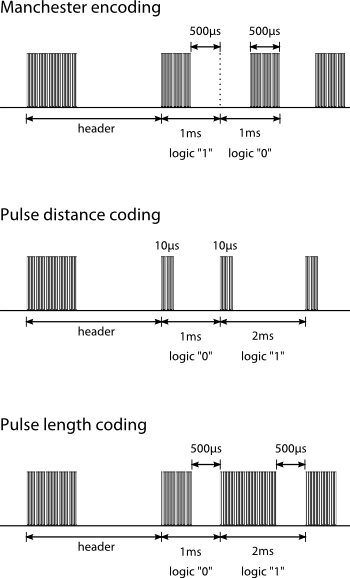 Protocols can be based on these transmission formats, but need not necessarily conform to them. So how do you know what your remote control uses? And how do you capture the sequence so that you can re-transmit it from an IR diode? It seems that Adobe has been releasing Flash Player updates very often, and it’s getting a little irritating since I told it to “notify me to install updates”. I’m generally very against software that automatically updates itself (like Google Chrome). I remember selecting the “Notify me to install updates” option the last time, and every time it installs a new update, the radio button goes back to “Allow Adobe to install updates”. Is there a technical reason why it could not have read my settings and defaulted to my previous choice? Absolutely not – it’s like those registration forms that automatically select the “send me your spam often” checkbox by default, except you’ll keep seeing this screen every time Adobe releases an update. This time Flash Player was upgraded to the 11.3 series, and all of a sudden YouTube videos sound like I’m watching them in a cinema. Why? Because the new Flash Player decided to play the YouTube stereo audio stream in 5.1 instead. Wow, what a load of crap! Someone has also voiced this out in the Flash Player forum and his solution was to install the older 11.2 version. If you found this irritating, you can go to the Archived Flash Player versions page and download a ~160MB zip file containing Flash Player installers for all 3 different platforms. I chose version 11.2.202.235 as suggested in the forum, and it fixed the problem. As you can probably tell, I’m quite pissed by this to write such a lengthy rant. Horrible software like this just irritates the hell out of me.